The Bad News Bears on VHS. Starring Walter Matthau, Tatum O’Neal. With Vic Morrow, Joyce Van Patten. Directed by Michael Ritchie. 1976. 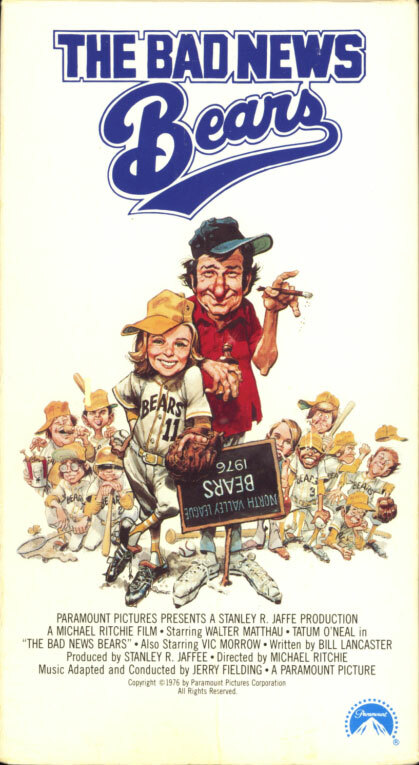 A major surprise as one of 1976’s top grossing films, The Bad News Bears is a movie about children that is refreshing, utterly believable, and quite cleverly funny. Walter Matthau is at his absolute best as the grumbling beer-guzzling former minor-league pitcher who gets roped into coaching a band of half-pint misfits somewhat loosely called a team. With this bunch in uniform, it’s impossible to get caught up in the suburban competitive spirit that drives other adults to extremes of parental discipline. So, instead, the Bears have a good time.